The holiday season is upon us and with it comes many opportunities for entertaining. This time of the year, however, we tend to have fewer choices of fresh vegetables to use for side dishes. One of my favorites is the often-maligned Brussels sprout. Brussels sprouts can be a very polarizing vegetable, usually because most folks were first introduced to an overcooked, mushy form of it prepared by their mothers or grandmothers. Prepared correctly, however, Brussels sprouts can be a delicious and nutritious addition to any holiday menu. Brussels sprouts are packed with glucosinolates, which are organic compounds that contain sulfur and nitrogen. Glucosinolates have been shown to help prevent certain types of cancers and lower blood pressure; however, if cooked too long then glucosinolates can take on the flavor of rotten eggs. It makes sense, then, to gently saute our Brussels sprouts to coax out their earthy, nutty flavor rather than boil them into submission. One of my favorite recipes for this vegetable that I’ve found is Sauteed Brussels Sprouts with Candied Pecans and Cranberries. The first time I had this dish was when my wife, Leah, made it several years ago for Thanksgiving. I’ve since used it many times, especially in the months leading up to Christmas. It goes extremely well with the deep rich flavors of beef, pork or roasted poultry such as turkey. The varied flavors and textures of this dish make almost every bite unique and delicious, holding your attention and entertaining you until it is finished. Using a food processor or a sharp kitchen knife, slice the Brussels sprouts very thinly. Place a large sauté pan over medium-high heat and add the bacon to the pan. Use a spatula to stir the bacon while the fat renders. Let the bacon cook until almost crispy. Add the sliced Brussels sprouts to the pan and toss (or stir with a spatula) until coated with bacon fat. Continue stirring the Brussels sprouts until their color has brightened and they become tender, approximately five minutes. Add the red wine vinegar to the pan and let it reduce, approximately one minute. Remove the pan from the heat, and then add the cranberries and chopped pecans. Toss and serve. One of the ingredients of the above dish is candied pecans, which is another one of my holiday favorites. These candied pecans are multi-functional: Use them to top sweet potato casseroles, serve with ice cream, leave them in a bowl as a bar snack, or bag them up as a great holiday gift for your neighbors. Whip egg whites until frothy, then toss pecans in whipped egg whites and let any excess drain off in a colander. Combine dark brown sugar, cinnamon, allspice, ginger, coriander seed, cardamom, kosher salt and cayenne pepper. Toss pecans with this spice mix until thoroughly coated. Apply non-stick spray to a cookie sheet, then lay coated pecans in a single layer on the cookie sheet. 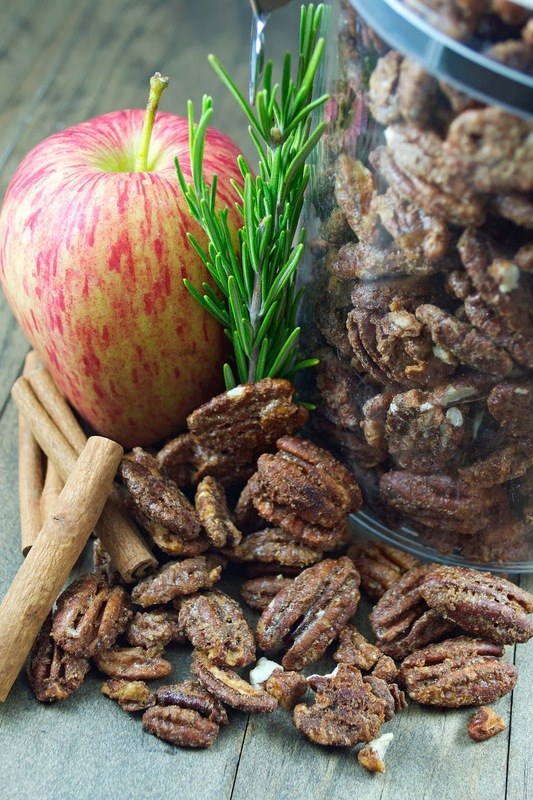 Bake pecans in a pre-heated oven at 300 degrees for approximately 30 minutes, until the pecans are toasted and dry. Every ten minutes, use a spatula to gently move the pecans around on the sheet tray to promote even cooking. Posted in Salad, Vegetable, WinterTagged brussels sprouts, candied pecansBookmark the permalink.